“Tiny Sparrow, Huge Deal” is a stone sculpture inspired by an article I read in Audubon Magazine about the Grasshopper Sparrow. The Florida sub-species of the Grasshopper Sparrow is the most endangered bird in North America. This is a four- or five-inch long sparrow with a 7-inch wingspan—tiny! It is a ground-nesting bird in prairie ecosystems and builds a tiny pouch-like nest in the tall grass. It eats mainly grasshoppers and shakes their long jumping legs off before eating them because the legs are too big for its little stomach. Its call is a high-pitched musical trill reminiscent of the buzz of a grasshopper. The Florida Grasshopper Sparrow is endangered due to habitat loss—its dry prairie ecosystem in central Florida has been reduced to about 1/10 of its historic size. Predation is another challenge—everybody eats Grasshopper Sparrows, and red fire ants are particularly destructive killing many hatchlings. Big storms and the resulting flooding destroy nests—powerful storms in recent years have happened right after many sparrows laid eggs. And, an intestinal parasite is killing many hatchlings. The Grasshopper Sparrow is a micro-fauna that very few people have ever heard of. It has no trouble reproducing in the wild and can lay up to 5 clutches of eggs in a season. Healthy populations were present in three sanctuaries in Florida since the 1980’s. Then, between 1999 and 2003, populations crashed with no obvious cause. The US Fish and Wildlife Service has been working with biologists in central Florida to develop a captive breeding program. Captive-bred sparrows were released back into the wild, but females were pushing their eggs out of their nests as if they did not know how to incubate them. Populations continued to fall. Biologists are to the point where they must decide whether to capture the remaining 75 individuals for a captive breeding program, or let the wild birds remain free while biologists continue to protect their nesting sites and monitor the sparrows. It is a dilemma with no guaranteed outcome. We are losing our wildlife. The last Dusky Seaside Sparrow went extinct in Florida in 1985. The Grasshopper Sparrow is on a collision course with oblivion. All of our iconic mega-fauna are threatened or endangered. Does it matter? Can we live in a world without the Florida sub-species of the Grasshopper Sparrow? Have we gotten along OK since 1985 without the Dusky Seaside Sparrow? Have we crossed a threshold unaware? How many more species will we lose before we care that we are destroying our world? It is a huge deal to me. I crossed my threshold a long time ago. I help myself, and others, when I act to protect endangered species and their habitat. My life is less rich for the loss of them. My world will be a more limited, crowded, polluted place if I don’t defend endangered species. Animals in all their diversity are an integral part of my happiness. 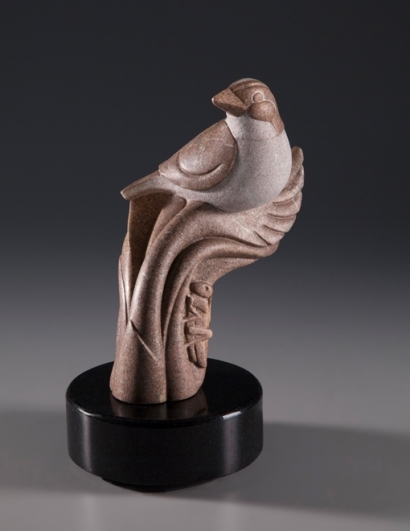 I carved “Tiny Sparrow, Huge Deal” from Ozark Rouge Marble. This is a new stone for me, and presented some new challenges. It is a beautifully speckled marble composed of bits of brown, black, white, pink, yellow, and green. It is quite hard and very crumbly, some of the white vein had calcite crystals and porosities, which dictated cutting slowly and grinding (rather than cutting) whenever possible. Finishing was a remarkable process since many of the colors are not visible until the stone is polished. I had intended to carve a feather design into the wings of the sparrow, but decided this was unnecessary since the gorgeous speckles are so indicative of the Grasshopper Sparrow’s natural coloring. I love when this happens–the stone speaks with an artistry more profound than anything I could impose upon it. 2018 is the Year of the Bird. Four leading bird organizations–Audubon, Cornell Lab of Ornithology, National Geographic, and Bird Life International–have joined forces to celebrate birds, create awareness of birds, and offer ways we can help birds to survive in an increasingly difficult time. When we help birds, we help ourselves. When we ignore the loss of diverse species, we seal our own fate.